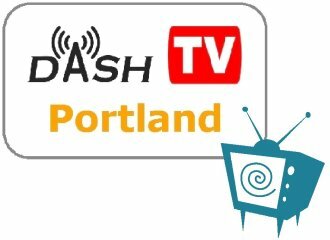 On April 24, 2010, six teams in Portland, Oregon played DASH (Different Area—Same Hunt). The theme for this event was "trapped in TV land." Unless noted, all links in this section lead to PDF documents. Note: order and presentation may be different than in other DASH cities. Time-wise, Dashland Shakespeare Festival finished earliest, with a total puzzle solving time of 4 hours and 34 minutes. Dirty Ashley had the fastest solve time out of the gate: 17 minutes on Late Night with Conan O'Brien. Plan Committee held the lead for a while, with the fastest solves and no hints on Lost and Dancing with the Stars. Gospel Tentacle Revival made good use of all the hints on Alvin and the Chipmunks and CSI. Despite having only two players, Children of XOG finished all but one puzzle (Brady Bunch). Score-wise*, Hot Air Balloon (Reinflated) had the highest total of 350 points. * Please note that the national scoring system only takes into account puzzle solving time and does not include travel time, specific number of hints taken, and other factors. Remember: the primary goal of DASH is to have fun! You can compare Portland timing data to other cities on the national scoreboard. To share your blogs/photos and discuss the hunt with DASH teams in other cities, visit the Puzzalot forum. To find out about future events, sign up for the DASH-announce mailing list or check the calendar maintained by Team Snout.